Every week, three young artists go room to room in a Winnipeg hospital, trying to coax seniors into picking up paint brushes — in some cases, for the first time in 60 years. "We set up a table in the dining room where the residents live and then we just go to everyone's rooms and get them out of bed or just get them to come sit with us and then we try to trick them into making art," said Toby Gillies. Gillies is an artist, and four years ago, he applied for a grant to teach art to seniors at the Misericordia Health Centre. "That's usually how it starts. It's like, 'Just come sit with us, listen to some music,' and then, 'Hey, you're here. Why don't you just try this?'" said Gillies. "Sometimes they love it, sometimes they prefer to just sit with us, but at least they gave it a try." Gillies started the program with help from the recreation staff at the hospital, and within the last year, it added two new artists in residence, Natalie Baird and Hannah Doucet. It's also expanded to two locations: the hospital, where seniors get interim care until they can go to a long-term home, and the seniors residence across the street. "Actually, when Edith moved across the street, and a few other residents, then we started doing an art program across the street as well," said Gillies. Edith Almadi, 83, has been going to Gillies' art classes for four years. She paints moons, rainbows and rocks with faces. As a child, Alamadi said art was discouraged, so she stopped making it. "I think what really surprises me, sort of consistently for four years, is how often somebody says, 'My teacher told me I was bad at this so I never tried it again.' I think that happens almost every workshop. At least one person says they were discouraged when they were a child and they never tried it again after that," said Gillies. Now, Alamadi says painting makes her "feel alive." "I just pick up the paint, and I can do whatever I want with the colours. They flow in my hand, and I like it. It's me. It makes me happy," said Alamadi. 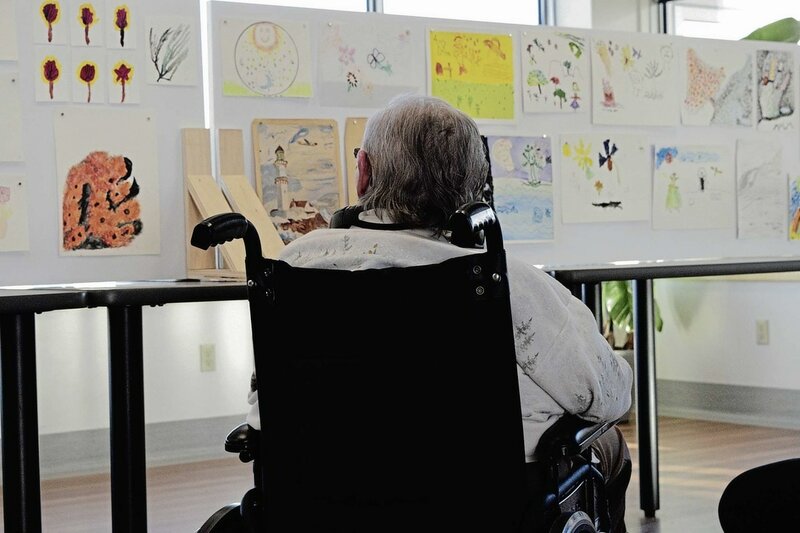 The program has regular art shows so residents can show off their work. On Thursday, the show's theme was animation, an ode to Gillies' animated moons and rainbows. Gillies, Doucet and Baird set up a cardboard green screen and a camera and made live animations from photos of the residents. They tossed balloons, wore paper hats and a few feet away, hundreds of pieces of art were on display. This year, they want to hold 10 shows, which Gillies said is in response to the realities of holding classes for aging artists. "The residents don't often stick around for long. It's interim care, so they move to a permanent care facility or they die or they forget they made the art," said Gillies. "We wanted to make sure they could come and have an art show while they still remember —while it's still relevant." Linda Skowronek moved into the centre less than a year ago, and she's been going to the classes every week since she arrived. Before that, she hadn't created art since high school. "He has paints and crayons and you do whatever you want to do," she said. "I'm no good artist, but I still enjoy doing it." The class has regulars, who Skowronek says compliment each other's work while Gillies, Doucet and Baird offer suggestions, new mediums and advice. "A lot of the residents look at their art, and they think it looks like kids art, but I don't think it does," said Gillies, who also happens to work at Art City, an inner-city art program for kids in West Broadway. "I guess I look at kids' art all the time, and I can see a distinct difference … I guess I see the life experience in their drawings … A lot of the people that have been coming have really been developing a personal style and an artistic voice." Right now, the program is funded year-to-year. The team applies for the funding and hopes for the best. "I really think it's something that needs to continue — the guilt I would feel if I stopped coming here while certain residents are still here!" said Gillies. Several shows are already planned for the rest of this year, both in the hospital and the long-term care home. The team also hopes to do at least one outside of the hospital and in the community. It’s never too late to learn a new skill, or rediscover an old one. Toby Gillies knows this better than anyone after spending five years working with Misericordia Health Centre as the artist in residence. Gillies hosts art workshops for the senior residents, encouraging participants to try drawing regardless of their health or ability. "It’s amazing and mind blowing every time I’m there," he said. "The stories I hear and the art that they’re creating. Every time I go someone says I’ve never made art or I haven’t done this since I was a kid and then they have so much fun doing it. "Usually they’ll say I can’t make a good painting, so I say, ‘Well, let’s just see how bad of a painting you can make.’"
For the session that just began Gillies has been working with local artists Natalie Baird and Hannah Doucet. The group recently hosted an art show at the health centre titled Heirloom, which is a culmination of work that was done last year as well as new pieces. "Last summer I was collecting plants from the rooftop garden and all the workshops we did were focused on botanical illustrations. People very often have a shaky hand so when the hand is shaking it can still draw beautiful plant life," Gillies said. 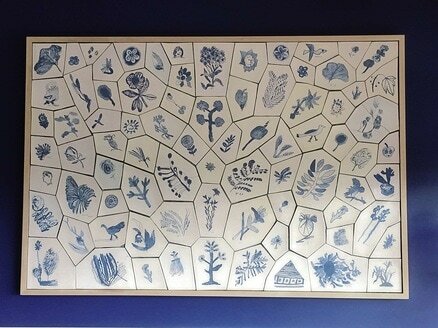 "Then I took their drawings and made a big ceramic wall piece, which I titled Heirloom. I wanted it to look like china my grandma had given me so that kind of heirloom and also referencing the generation of people we were working with and also the plant kind of heirloom." He said the show got residents and their guests talking. "Residents were dancing and were surprised to see that their artwork was up," he said. "There are various degrees of disability that people are living with so those that remember making the art, the really enjoyed seeing it after and welcomed the opportunity for people to talk to them about their work." Over the years, he’s seen art transform residents and bring out skills they didn’t know they had. One man was a travelling salesman and never did any art, Gillies recalled, and after one workshop fell in love with drawing. "His room is just completely covered in his art, every square inch of his walls. It’s a real point of pride for him and his family." Gillies said the workshops and shows are a positive experience for the residents and have an empowering effect. The socializing is an important piece of it, as well as residents feeling included and doing something expressive. Read more by Alana Trachenko. A Misericordia Health Centre resident checks out the Heirloom art show. Toby Gillies' collaborative piece, titled Heirloom. It features drawings by workshop participants.